Pairing dishes in order to serve up a great meal is an art. Most households would prepare main meals and side dishes, but rarely do people pay attention to condiments these days. They should. In the past condiments meant strictly pickle or other preserved food to boost the flavours in a meal. It can either make a bland meal flavoursome or make an adequate meal extravagant. These days, condiments have taken on a new meaning to incorporate sauces and in some places like Europe, even cheese. It is usually distinguished from side dishes by being a lot less in portion as it is not the main dish but complements both the main and side dishes. 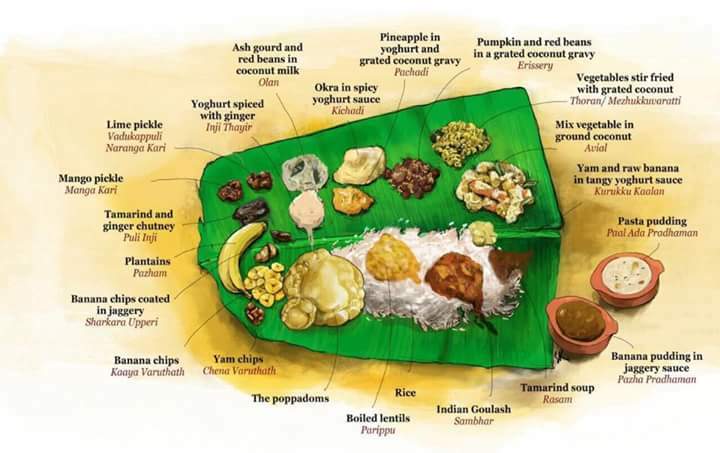 If you are in India or South East Asia, you can expect to be served a bountiful banana leaf meal as in the picture above. Notice how the meal is made a lot more elaborate by little portions of condiments. Even the arrangement of the food on the banana leaf is orderly. First you have the main meals in a row. Behind that are the side dishes and then the row furthest away from you at the edge of the leave, are the condiments. Any guesses which are the side dishes and which the condiments? Mixed vegetables in ground coconut, vegetable stir fried with grated coconut, pumpkin and red beans in grated coconut gravy, these are all clear-cut side dishes. Now banana chips is also a side dish but notice the smaller portion of yam chips? So the yam chips will become a condiment as the banana chips take precedent in the meal. Quite obvious condiments here would be lime and mango pickles, tamarind and ginger chutney. I would add to that, the yoghurt spiced with ginger. As for the pineapple and okra, the same arrangement applies with the banana and yam chips. Being the larger portion, the okra would be the side dish and the pineapple the condiment. 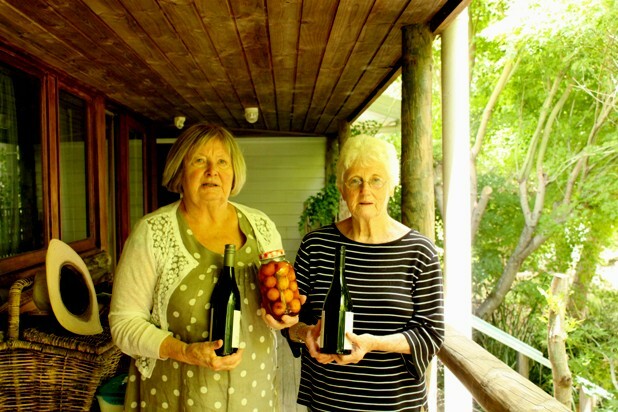 It is interesting to explore the condiments of different cultures and right here in Australia, I paid a visit to Jean Sadler to observe how she made Green Goddess Dressing, a very popular condiment in the 1960s. Jean is what I would call a professional home chef. My personal opinion is that home chefs are more professional than celebrity chefs or chefs who own restaurants. The reason being the home chefs are not under pressure to cook for a multitude of people every day. So they have the time to be creative and explore their skills and craft to the fullest. Also home chefs tend to focus on healthy cooking as they are cooking for their own families whereas commercial cooking simply cannot compare. 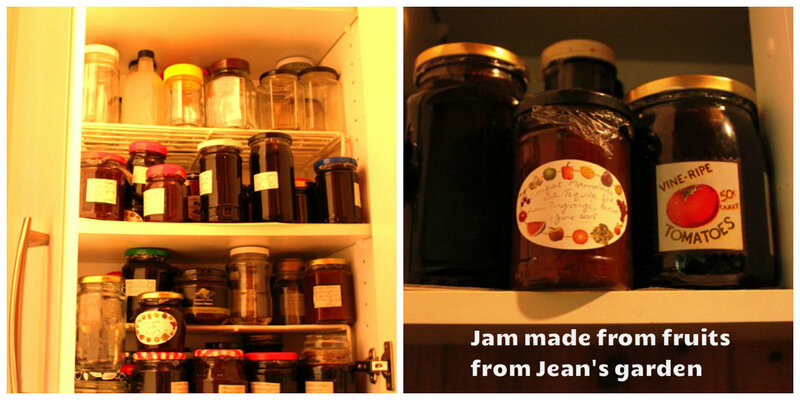 The other highlight of my visit is to take a peek into Jean’s kitchen larder which is overflowing with jam made from various fruits, mostly grown in her home garden. One particularly delicious jam she gave me to take home was kumquat and tequila made from kumquats grown in her garden. This inspired me to get my own kumquat tree. 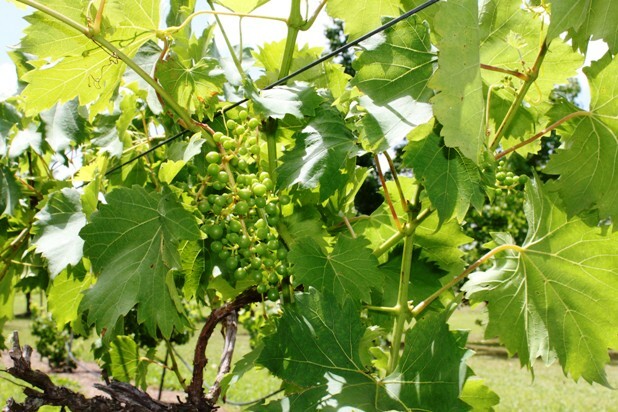 Jean is also an expert wine-maker who makes wine from grapes in her own little vineyard at the back of her house. 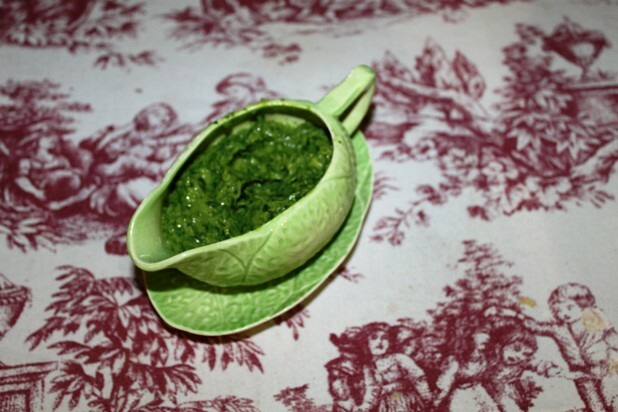 To kick-start her condiment she gave me and my mother-in-law Olwen a lovely history of Green Goddess dressing. She fondly recalls how you could readily buy it from the supermarket during that era as popular brands such Seven Seas (now bought over by Kraft Foods) were producing them. The original Green Goddess dressing is the creation of chef Philip Roemer of the San Francisco’s Palace Hotel in 1923 to honor actor George Arliss, who stayed at the hotel while performing in William Archer’s hit play, “The Green Goddess”. This hotel first opened in 1875 and was the largest hotel in the West for many years and one of the earliest to start the tradition of celebrity chefs. 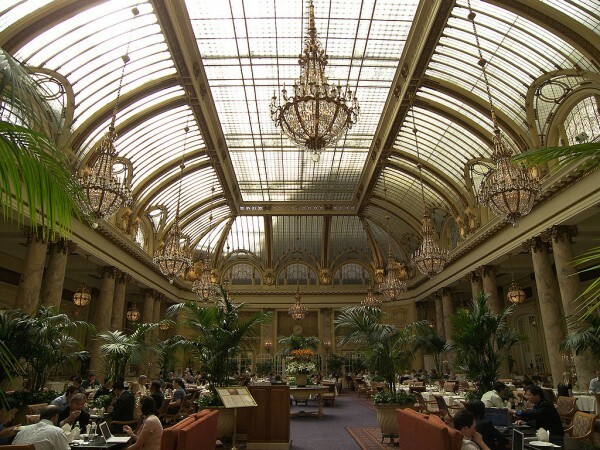 In 1903 the Palace hotel was devastated by an earthquake and fires but was restored and reopened in 1906 to a huge opening ceremony attended by the rich and famous. Green Goddess dressing is still on Palace Hotel’s menu today with some changes from the original version, which is the addition of more herbs and the elimination of mayo and dairy. Another age-old item that has survived till today is crab salad and buttermilk biscuits that has been on its menu since 1909. Another famous condiment, the thousand island sauce/dressing which everyone has heard of because it is still popular today is another condiment borne out of a hotel. It was created by George Boldt, proprietor of Waldorf Astoria Hotel in New York. 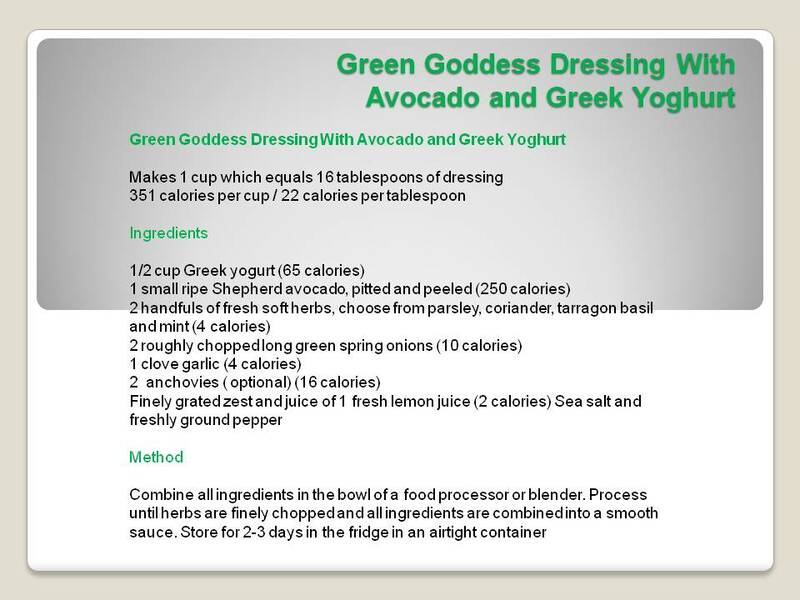 Green Goddess Dressing is so easy to make. Just watch the video below. This dressing is so versatile I use it as a dip, salad dressing and even as a pizza sauce topping.